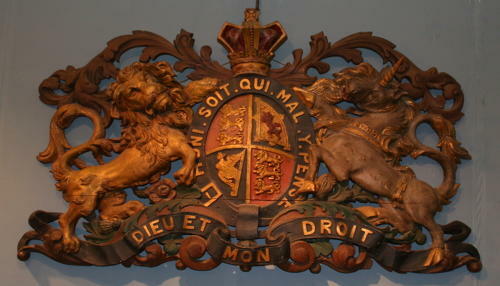 An Amazing English Victorian Carved wooden and polycromed Royal Coat of Arms. c.1890. Carved by Fairground carvers Savage's, for the Carousel ride, George Green's "Cockerels and Bantams" , exported to Coney Island,New York in 1913, remaining there till broken up. See "Fairground Art" by Geoff weedon and Richard Ward, Page 28.